To reduce hospital-based appointments for patients with low risk eye disease in Western Sydney, while maintaining clinical standards of care. Improves health outcomes for patients with low risk or stable eye disease. Provides clinically appropriate and timely care for ophthalmology patients. Provides services in a convenient community location with reduced clinic wait time. Improves partnerships between private and public healthcare organisations. Improves access to public ophthalmology services and continuity of care. Provides a streamlined referral and assessment process. Enhances the existing skills of optometrists and provides ongoing training. Empowers patients to play an active role in their health care. Australian clinical guidelines recommend a collaborative approach for the management of low-risk eye glaucoma and diabetic retinopathy.1-3 However, collaborative eye care arrangements are limited in Australia, particularly with NSW Health ophthalmology services. Prior to the project, Westmead Eye Clinic was not able to meet the demand for services in Western Sydney, based on hospital data that showed approximately 126,000 diabetic and 45,000 glaucoma patients in the Western Sydney population. International research suggests that collaborative eye care models (including refined referral pathways, optometrist training and virtual ophthalmologist review) can improve service delivery, by reducing hospital ophthalmology appointments and associated costs.4-8 It was determined that WSLHD needed a new referral pathway to maximise resources and ensure low risk chronic eye disease patients can receive the right care, in the right place, at the right time. 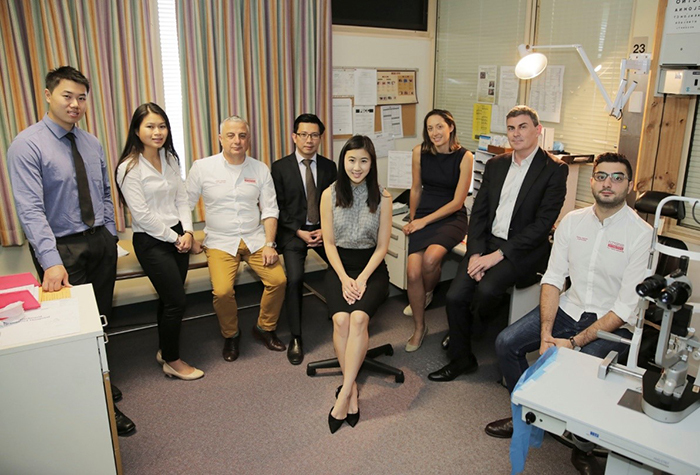 Westmead Eye Clinic developed an innovative referral pathway, called C-EYE-C. It is based on international evidence and suitable for all NSW Health facilities. 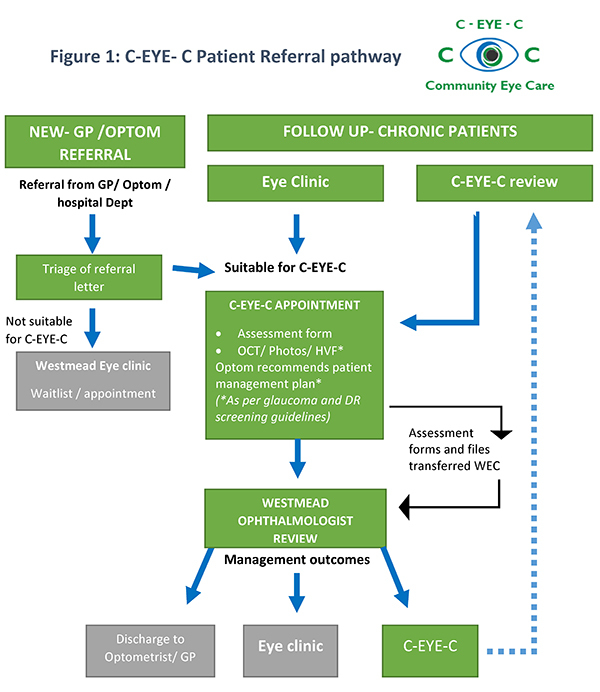 The new referral pathway (Figure 1) sends low risk chronic eye disease patients to community-based optometrists for assessment. During the appointment, the optometrist completes a standardised eye assessment, including imaging, and recommends a patient management plan. The files are then transferred electronically to Westmead Hospital for ophthalmologist review. The ophthalmologist confirms the diagnosis and management plan, and either refers the patient back to C-EYE-C for a follow-up review, refers them to Westmead Eye Clinic, or the patient is discharged to their local general practitioner or optometrist. Triage guidelines and referral letters were developed for this project, in addition to formal partnership agreements with private optometrists. The program is designed to integrate with existing systems to minimise resource demand. This includes triaging referrals using existing processes, booking appointments and corresponding with patients using the local health district patient administration system, and maintaining records of assessments and imaging in the patient’s electronic medical record. Additional processes for improved communication with primary care providers will be developed to support this integration. During the trial, 699 patients were examined by optometrists, and future projections suggest that 1400 patients each year will be suitable for the program. Two-thirds of all patients (62 per cent) in the program required no further hospital appointments, which has improved capacity in the Westmead Eye Clinic (Figure 2). Agreement between optometrists and ophthalmologist review was 82 per cent for management and 75 and 84 per cent for glaucoma and diabetes diagnoses respectively. of those who drove to appointments, only 10 per cent had problems with parking. C-EYE-C is suitable for implementation in other local health districts, particularly in rural and remote areas where limited ophthalmology services are available. It also has potential to expand into other eye diseases such as early cataract monitoring. The project’s evaluation, supported by the ACI Ophthalmology Network, will be used in the development of model of care guidelines to assist wider implementation. It is expected that the C-EYE-C model will become more efficient and refined through continual feedback and improvement. Changes to health care models is gradual and requires patience and perseverance. Break down the new model of care into individual steps or processes, then develop and test each new process with input from appropriate teams and stakeholders. Develop good rapport and communication channels between participating clinical providers, to ensure ongoing troubleshooting and improvement can be achieved. Standardisation of clinical forms and protocols ensures consistency in patient care, improving continuity of care between community and hospital services. Use real-time project data as evidence to support the project and motivation for change. Data-driven projects will sell themselves to hospital and statewide decision makers. Royal Australian and New Zealand College of Ophthalmologists (RANZCO). Principles for Collaborative Care of Glaucoma Patients. Surry Hills NSW: RANZCO; 2015. White A, Goldberg I. Guidelines for the collaborative care of glaucoma patients and suspects by ophthalmologists and optometrists in Australia. Clinical and Experimental Ophthalmology 2014;42(2):107-17. Commonwealth of Australia. Guidelines for the management of diabetic retinopathy. Canberra ACT: National Health and Medical Research Council; 2008. Bourne RR, French KA, Chang L et al. Can a community optometrist-based referral refinement scheme reduce false-positive glaucoma hospital referrals without compromising quality of care? The community and hospital allied network glaucoma evaluation scheme (CHANGES). Eye 2010;24(5):881-87. Devarajan N, Williams GS, Hopes M et al. The Carmarthenshire Glaucoma Referral Refinement Scheme, a safe and efficient screening service. Eye 2011;25(1):43-9. Keenan J, Shahid H, Bourne RR et al. Cambridge community Optometry Glaucoma Scheme. Clinical and Experimental Ophthalmology 2015;43(3):221-27. Trikha S, Macgregor C, Jeffery M et al. The Portsmouth-based glaucoma refinement scheme: a role for virtual clinics in the future? Eye 2012;26(10):1288-94. Henson DB, Spencer AF, Harper R et al. Community refinement of glaucoma referrals. Eye 2003;17(1):21-6.